Well Gennady Golovkin vs. Saul Alvarez is history. We got the fight we wanted on paper but for me we did not get it on the canvas. It was an interesting fight at most. No blame associated with Golovkin. He was just a little more cautious than usual but made the fight. 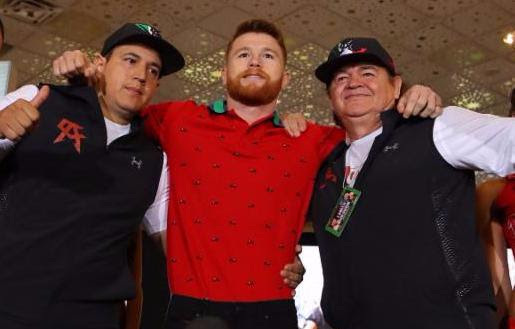 Alvarez seemed to want to steal the fight not win it. If Golovkin had not forced the action there would not have been much action. For a known big puncher Alvarez spent more time avoiding trading punches than throwing them. I don’t know what his overall games plan was. At times I thought it was to let the eight years older Golovkin punch himself out and indeed he did mop-up the last three rounds on the cards of all three judges but that just goes to show how little he had done over the first nine rounds. For me Golovkin won the fight clearly but if others saw it differently-even Ms Byrd-that’s OK it is inherent in the way fights are scored. Golovkin came away with his reputation intact. Alvarez is still a great fighter and for sure a future Hall of Fame inductee and he will be in more big fights but for me he turned in a mediocre performance. Hopefully they will fight again and sooner rather than later. We saw how delaying the Floyd Mayweather Jr vs. Manny Pacquiao fight for too long a time took some of the edge of it and neither fighter was at his peak when they did clash. If you needed an indication of how different boxing is today then you just need to see how easy it was to make fights 60-70 years ago. The then unbeaten Sugar Ray Robinson outpointed Jake LaMotta in October 1942. LaMotta got his revenge with a points win over Robinson in February 1943. They fought again three weeks later when Robinson won. Two of the biggest names in boxing in that era and they fought each other twice in three weeks! So sad to see that the “Ragin Bull has passed. He fought everyone who was anyone in his era. Typically for an incident filled career he won the title in September 1950 when with the fifteenth round starting he was behind on all three cards against Frenchman Laurent Dauthuille but he knocked Dauthuille out just 13 seconds before the final bell in what was the Ring Magazine Fight of the Year. Who did he lose the title to? Well Robison of course. That put Robinson 5-1 up in their series and was the last time they fought each other. LaMotta was an ever present at the Hall of Fame inauguration days and even in his nineties a lively spirited man as befits one of the great fighters of his era. RIP Jake. I was surprised and sorry to read that Andre Ward has decided to retire. He goes out at the top and unbeaten. He scored victories over Mikkel Kessler, Arthur Abraham, Carl Froch, Chad Dawson and Sergey Kovalev twice, in fact all of the big names around in his two spells of competing at the top. Kovalev and Carl Froch were the only ones to get close to victory over the “Son Of God” with three scores of 114-113 giving him a controversial win over Kovalev in their first fight and two of the judges scored for Ward 115-113 when he beat Froch. If he has lost his passion for the sport then he has made the right decision but it is a pity that he took almost two years out when at his peak and I just feel he could have achieved even more but for that break. Good luck Andre-and please stay retired. Ward’s most recent adversary Sergey Kovalev will return to the ring in November in New York with Ukrainian Vyacheslav Shabranskyy in the other corner. Not a bad fight but with Shabranskyy having been down three times and knocked out by Sullivan Barrera in December that takes a bit of the shine off it. We have Joseph Parker vs. Hughie Fury on Saturday night which kicks off a series of heavyweight title fights that will see all four versions of the heavyweight title on the line. Naturally right now an Anthony Joshua fight is the biggest news in the heavyweights and he puts his IBF and WBA titles on the line against Bulgarian Kubrat Pulev in Cardiff on 28 October. Neither fighting in the United Kingdom or facing a British opponent will be new for Pulev as he won a European gold medal in Liverpool and is 3-0 against British fighters but Joshua is naturally the favourite and it will be interesting to see whether he can get Pulev out of there quicker than the five rounds it took Wlad Klitschko to do it. The third in the series is Deontay Wilder vs. Luis Ortiz in New York on 4 November. The Cuban is 38-years-old and the only names on his record are Bryant Jennings and Tony Thompson-neither really stellar quality but it says everything about how Wilder has hand-picked his opponents that this is seen as his sternest test so far. By December it could be all change or as you were but at least the heavyweight division is interesting again. The IBF have ordered negotiations between Tevin Farmer and Kenichi Ogawa for their super feather title. It became vacant when Gervonta Davis failed to make the weight for his defence against Francisco Fonseca last month. Ogawa is No 4 and Farmer No 5. The first two places are vacant because no fighter has beaten a rated fighter so no one can go into those spots. Australian Billy Dib is No 3 but seems to be sidelined but there might be a stipulation for the winner of Ogawa vs. Farmer to defend against Dib. The WBO have refused Zou Shiming’s request for an immediate rematch with Japanese fighter Sho Kimura who lifted the Chinese fighter’s flyweight title with an eleventh round stoppage in July. Instead the WBO have ordered Kimura to defend against Toshiyuki Igarashi. There is some justice there as Igarashi has been their No 1 since March and he was by-passed and the No 6 Kimura was given the title shot. As I write this the second quarter-final in the cruiser ranks of the World Boxing Super Series between Yunier Dorticos and Dmitry Kudryashov will take place in San Antonio tomorrow night. The initial fight between Oleg Usyk and Marco Huck was disappointingly one-sided but this one should be more competitive. Dorticos secondary WBA title will be on the line but with the possible rewards from winning this tournament the WBA trinket is an irrelevance. Going back to San Antonio Nonito Donaire has his first fight since his loss to Jesse Magdaleno for the WBO title and he takes on Mexican Ruben Garcia for the vacant WBC Silver title at featherweight. It is ten years since Donaire won his first world title and of course he has gone on to be a four division champion. It seems that at 34 there is still plenty of ambition there. Garcia has impressive looking statistics at 22-2-1 but his record has some heavy padding with his last seven victims having combined records of 17-69-2. Curiously for a title which the WBC put so much emphasis on neither Donaire nor Garcia is in their top 40. After giving it some thought Roman Gonzalez has decided to fight on. His crushing loss to Srisaket had him seriously considering retirement but he has said he wants to bring another title back home to Nicaragua. A show is being staged in Paris by the Asloum group as a tribute to young French boxer Angelique Duchemin. The 26-year-old “Princess of the Ring” died during a training session in the gym possibly due to a pulmonary embolism. She won the French and European super feather titles and in May added the WBFederation title. Such a tragedy. The main event will see Karim Guerfi defending his European bantamweight title against Belgian Stephane Jamoye with French lightweight Elhem Mekhaled facing Cindy Bonhiver in a lightweight fight between two French female fighters. There are some other French fighters turning out for this tribute show. Puerto Rico lost one of its finest boxing journalists and public relations experts with the death of Mario Rivera Martino at the age of 94. I grew up reading Mario’s reports in Ring Magazine so he is part of my memories from those days so long ago. He also did a great job as PR consultant to the WBO and wrote for Sports Illustrated but for me he will always be an important part of that era when my interest in boxing started to flourish. Thank you Mario. And RIP. Forty-year-old former cruiserweight champion Tomasz Adamek is going to fight on and is in training for a fight later this year but no opponent named. Boxing is a universal sport embraced by all peoples. However there have been very few Native Americans who have made headlines. There have been a number competing over the years in the US National Championships and the National Golden Gloves but very few in the pros. For that reason it is always good to see a young Native American dipping his toe in the pro ranks. On 16 September on a small show in Oregon State fairgrounds Salem super feather Blaiwas Eaglepipe took a six round decision in his first pro fight. He ended up with a few cuts here are and there due to some headwork from his opponent-welcome to the pro game Eagelpipe! He is a descendant of “Captain Jack” a leader of the Modoc tribe which resisted the US Army for many months in the lava beds of Oregon before being forced to surrender. I will leave young Eaglepipe alone now as he is just starting out and he needs time to develop his career under experienced trainer Fred Ryan away from any undue publicity. I wish him well. A couple of interesting fights coming up in Africa. On 6 October South African Mzuvukile “Old Bones” Magwaca 19-0-3 puts his IBF Inter-Continental bantamweight title on the line against Namibian Immanuel Naidjala 23-3-1in Kimberley South Africa. Magwaca already holds the WBFederation title. In Accra Ghana aging Braimah Kamoko faces young pretender Bastie Samir on 21 October. The 37-year-old Kamoko has never lost a fight but due to serious questions raised over his eye-sight has never fought outside Ghana. This will be his first fight since December 2015. Samir, 26, turned pro in the USA and had his first 11 fights there going 10-0-.1 He then built his record to 15-0-1 but was inactive in 2014 and 2015 and had just one fight in 2016. In world terms this is a non-event but when it was first announced the fans broke down the doors for tickets. There has been plenty of publicity for the fight but Kamoko styling himself the “African Mayweather” is taking things too far. I have left any comments on the scoring at the Golovkin vs. Alvarez fight until the end as it just served to divert some attention away from the fight and I don’t want to do the same. I am not going to pillory Adelaide Byrd. I had it 117-112 for Golovkin so I also disagreed greatly with Byrd’s score but also to a lesser degree with hose tuned in by the other two judges but the social media also shows there are plenty out there who had Alvarez the winner. Byrd has worked as a judge for 443 fights including 107 world title fights across the whole span on the sanctioning bodies. I looked at every one of those 107 fights and struggled to find more than one or two instances where she differed to any significant degree with the other two judges. Just eight days before she officiated at the Golovkin vs. Alvarez fight she worked the fight between David Benavidez and Ronald Gavril for the vacant WBC super middle title. Byrd and Dave Morrell scored it 116-111 and 117-111 respectively for Benavidez. Glen Trowbridge scored it 116-111 for Gavril. There is a huge gap between how Morrell and Trowbridge saw the fight-but no big hullabaloo-hey that’s boxing. On the same night in Cebu City one judge had Milan Melindo winning 117-110 and another had Hekkie Budler winning 115-113 and even on the same Golovkin vs. Alvarez show one judge had Ryan Martin winning 96-93 and another had Francisco Rojo winning 99-91. When you look at Byrd’s score in that context it is just another example of the ridiculous way of scoring boxing matches we are stuck with. Her scorecard was no worse than many others we see every week. She gets pilloried because the event was such a big one and the scoring in the Melindo vs. Budler and Benavidez vs. Gavril hardly merit anything other than a side note. I have said before that if boxing was invented tomorrow there would some form of computerised scoring used. Even that is not perfect for as the saying goes “rubbish in rubbish out” so the accuracy depends on the competence of the operator. CompuBox is already effectively doing that type of computer approach showing punches thrown, punches landed, jabs thrown/landed, power punches thrown/landed but I find myself wonder how many light jabs equal one power punch? One, ten, twenty. Is that written down somewhere and if so who devised the system? So even registering the punches landed is not the end of the complex calculations. I have seen it suggested that punch counting might work but then you need to decided if you are going to add all the punches at the end and see who has landed more in the whole fight or allocate on a round by round basis i.e. 10 points to the guy who landed more in that round . Sounds OK but what if a guy scores one more punch per round for nine rounds and his opponent sores 20 more punches in the last, and does a knockdown just count as one punch? We are stuck with what we have and you can be sure there will be some controversy over scoring in fights this weekend-and for ever more. That’s the bad news on scoring boxing matches-there is no good news.